If you own an Asian restaurant or plan to start one, your most important culinary tool will be the wok. A wok is a specially curved pan that is practically inseparable from the idea of Asian cuisine. Woks are traditionally used for quickly frying meat, rice, and vegetables, but you can also use a wok pan for deep fried foods. If you've never used a wok before, or you want to learn how to make the most out of your high quality wok, these four tips on wok cooking will help you choose the right wok, use it correctly, and master the technique. Before you even begin cooking in your Asian restaurant, it's important to ensure that you have the right sized wok. Most restaurants that feature Asian cuisine use woks that are no larger than sixteen inches in diameter. There are two reasons for this. First, stir fry dishes are often prepared per customer rather than made in advance en masse, so an enormous wok is not a necessity. Second, woks that are too large may not heat up quickly enough for efficient stir frying. 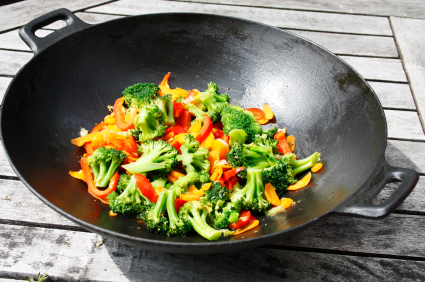 It is just as important to choose a wok that is large enough as one that is not too large. If your wok iis not large enough, the food that you are cooking may not come into contact with the wok surface. The materials used to make your wok are just as important as the size. A stainless steel or iron wok can be seasoned, which means that the metal itself is fused with oil and flavors that are imparted in the dish during the cooking process. You can buy woks that are pre-seasoned, or you can season a steel or iron wok yourself by brushing it with oil, adding flavorings and spices, and heating the wok until the oil is absorbed. It is very important to prepare your cooking ingredients before you begin using your wok. The cooking technique used in wok cooking requires high heat and minimal cooking time, which means you won't have time to leave the wok and slice more vegetables or meat. Prepare all your ingredients in advance and place them together in the wok for fast, flavorful cooking. Selecting the right oil is one of the biggest challenges that chefs face when using a wok for Asian cooking. It is crucial to select oil with a high smoke point, as woks must be heated to about 400 degrees for ideal cooking. Oil with a low smoke point, such as olive oil, cannot handle this high heat and may break down and become rancid during cooking. Coconut oil is one of the healthiest oils with a high smoke point and is commonly used in wok cooking. Before you add the oil to your wok, heat the pan until it begins to smoke. This indicates that the metal has expanded and the seasoned flavors are being released. Add the oil to your pan followed quickly by your ingredients. Always keep the food within your wok moving by either shaking the wok or by using a curved spatula or spoon if your wok is too heavy to handle.